Very young he left to Germany to try earn his fortune. Then he initiated his life as a wall painter. Later on he made a considerable fortune. He was a remarkable artist, having left several oil paintings of his family members and landscapes. Among others he painted: his father, Isaac Abecassis, his mother, Helena Bensaude, his sister in law, Sophia Amzalak Buzaglo, his nephew Raul Isaac Abudarham Abecassis, himself and his daughter Madeleine. He was a great gambler and went several times with his nephew José Abudarham Abecassis to Casino do Estoril. He lived several years in Rua Borges Carneiro, 24, in Lisbon, and later he built his home in Monte Estoril and another one in Vila do Conde, Avenida Marginal, where he spent his Summer time. He inherited a quinta in Paço do Lumiar, from his uncle Henrique (Henry) Nathan Bensaude where he lived for a while and then sold to dr. José de Azeredo Perdigão, president of Gulbenkian Foundation. He married for the first time with Anna Leroi, sister of Otto Leroi, then he married Maria Luiza d'Almeida Brandão. 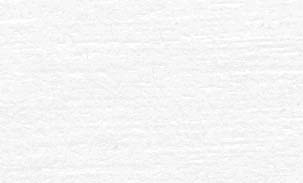 She was born in 1893, in Lisbon, and was daughter of Manuel de Almeida Brandão and Maria Balbina Nolasco Pereira da Cunha both born in Brazil where they married. She was grand daugther, from her father side, of Comendador Manuel Francisco de Almeida Brandão and his cousin Maria de Almeida Brandão. She was grand daugther, from her mother side, of Joaquim Nolasco da Fontoura Pereida da Cunha and Maria Isabel Pereira da Cunha. 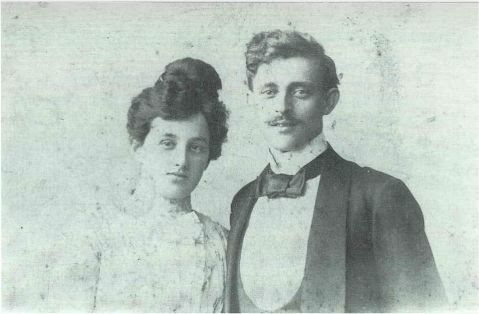 Fred Abecassis and his first wife Anna Leroi. 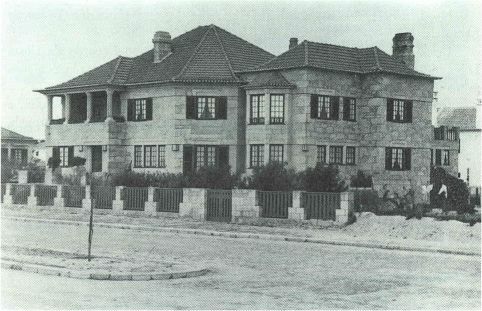 Vila do Conde, 1954, Summer residence of Fred Abecassis. "Abecassises Novos". 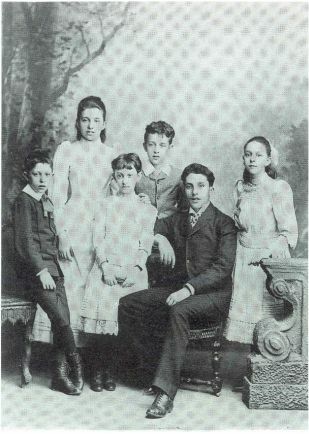 The six brothers, from left to right: Max, Julietta, Sarah, Fred, Fortunato and Rachel. Abecassis brothers, sisters and wives and husbands. Photographes in a Quinta in Lumiar from Fred Abecassis. 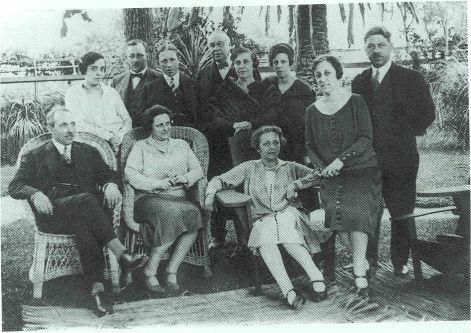 Standing up: Maria Luísa d'Almeida Brandão (married with Fred Abecassis); Fred Abecassis; Max Abecassis; Henry Scholtz (married with Rachel Abecassis); Merita Abudarham (married with Max Abecassis); Rachel Abecassis; Salomão Seruya (married with Sarah Abecassis). Sitted: Fortunato Abecassis; Sophia Buzaglo (married with Fortunato Abecassis); Julietta Abecassis and Sarah Abecassis. "Primos Abecassis, Azulay e Buzaglo de bicicleta". 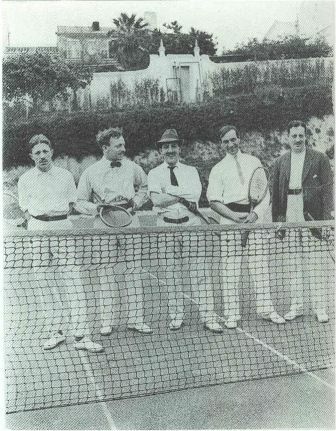 From left to right: Fortunato Abecassis, David Abecassis, Isaac Azulay, Salão Buzaglo and Fred Abecassis. 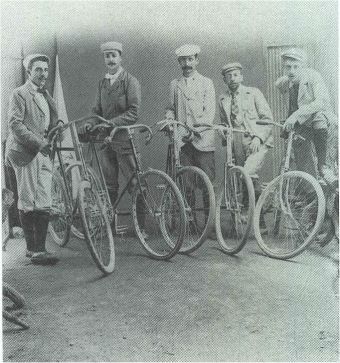 From left to right: Max Abecassis, Fred Abecassis, Fortunato Abecassis, Edgard Plantier and Carlos Buzaglo. Photographed in Rua Saraiva de Carvalho, 97, Lisbon, in May of 1915, by João R. de Bianchi.